This is the Limited Edition "Vampirella Blood Drive Premiere" scarf, autographed by the famous Vampirella Illustrator Gonzalez Mayo. Signed and numbered edition, number 88 out of 100. These were produced for the Comic Book Extravaganza, February 5, 1995. They are signed and numbered, and reputed to be limited to only 100, yet the one I have is numbered 154/200! Black art and lettering on a red cloth! The scarf measures 14 inches by 14 inches. 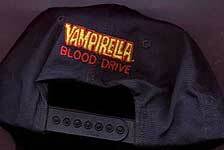 Another Blood Drive item is the Vampirella Baseball Cap/Hat. 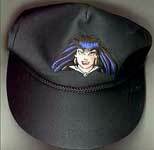 Embroidered on the front and the back, this is a nice cap (comfortable too!). I have no information on this other than the label on the inside which tells me it was made in the Dominican Republic. I have no information on this other than the eBay description - Each purse is embellished with matching glitter colours and accenting stones- mostly vintage. Measures: 4" x 7" and is 1 1/2" wide. 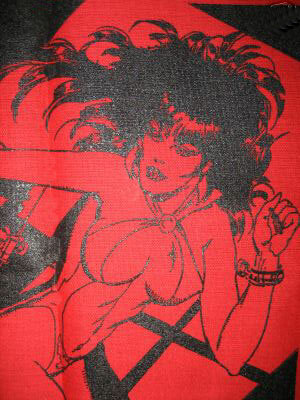 An interesting Vampirella image that I don't recognise - Adam Hughes, perhaps? 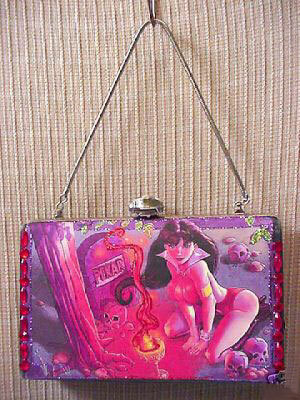 I believe that this is not a "professionally" made purse, rather someone working from home creating various "Crafts". 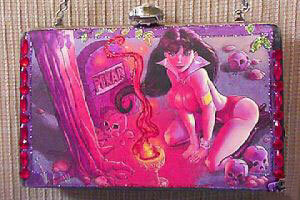 I have even less information on the purse below. 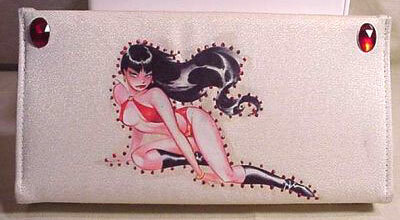 Again, I think this was a homemade purse which I saw on ebay a long time ago. 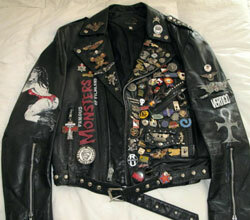 Seen in all the best places, this leather jacket is a homage the Warren era with buttons and patches relating to the horror genre of the sixties and seventies. 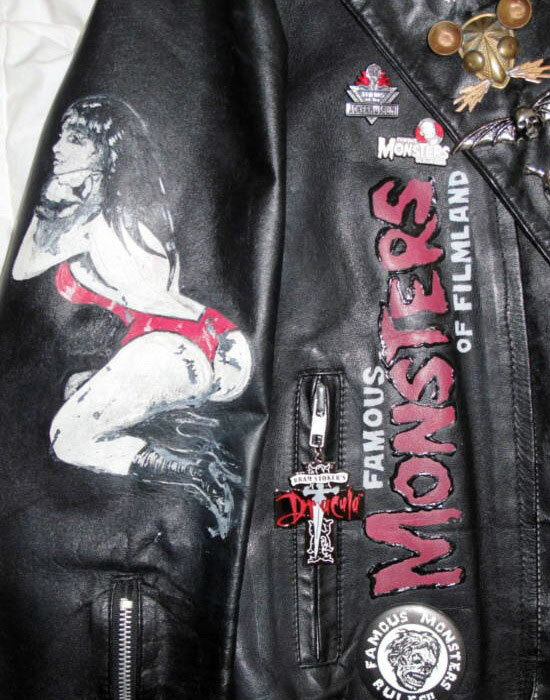 And, of course, what horror homage from that time would be complete without Vampirella. The ultimate in cool, Sean.